The large barrel is the fundamental and most important element, but it is also the least obvious to build with LEGO bricks. I knew the Model Team style interpretation that Lasse Deleuran gave to this challenge, about two years ago. He also made it in such a way that it can work as a GBC module. Now he made some updates in the drivetrain to make it a true 8x4, and also used some new elements. Here it is the end result. Awesome! Although it is a Model Team style, it also includes a lot of built-in Technic expertize, but does not resume to that. The inner side of the barrel, which forces the "cement" content to come out, is a masterpiece made in bricks. There is also a clever mechanism to start/stop and reverse barrel rotation. 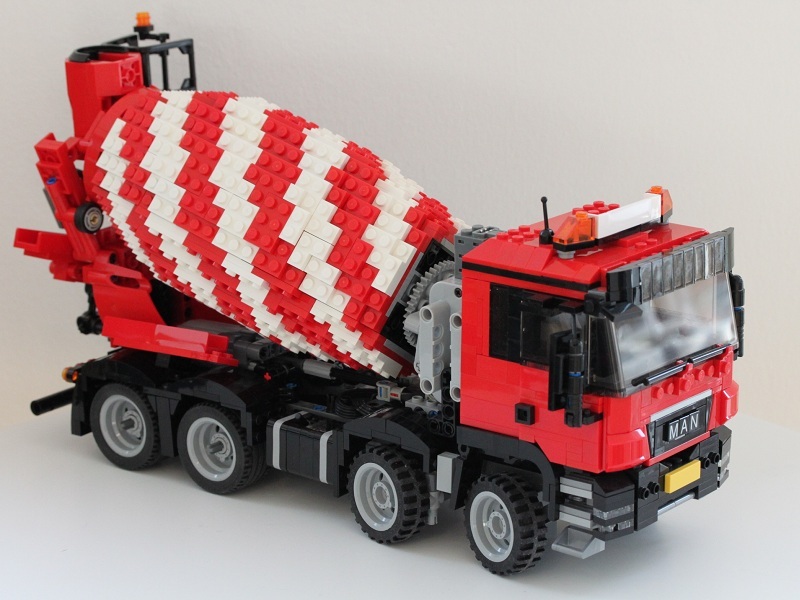 If you want to build your own Cement Truck like this, you may download the preliminary building instructions from Lasse's website. Additionally you may also find many pictures from this model, at his Brickshelf Gallery. Thanks for the feature. I have just added images to the instructions to help with the wiring for the electrical components. This completes the instructions.